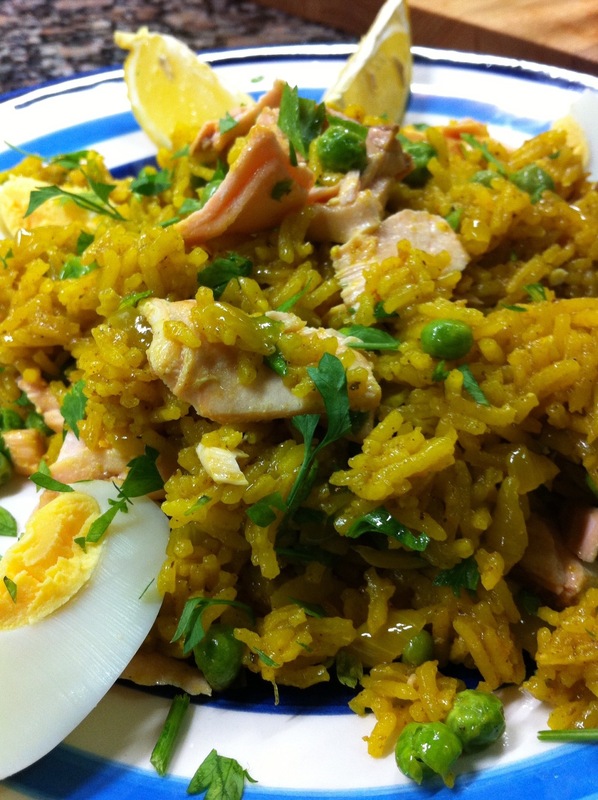 Kedgeree – a bit like Paella but curried! Before any of you ask, this was not a student creation from my University days gone by! 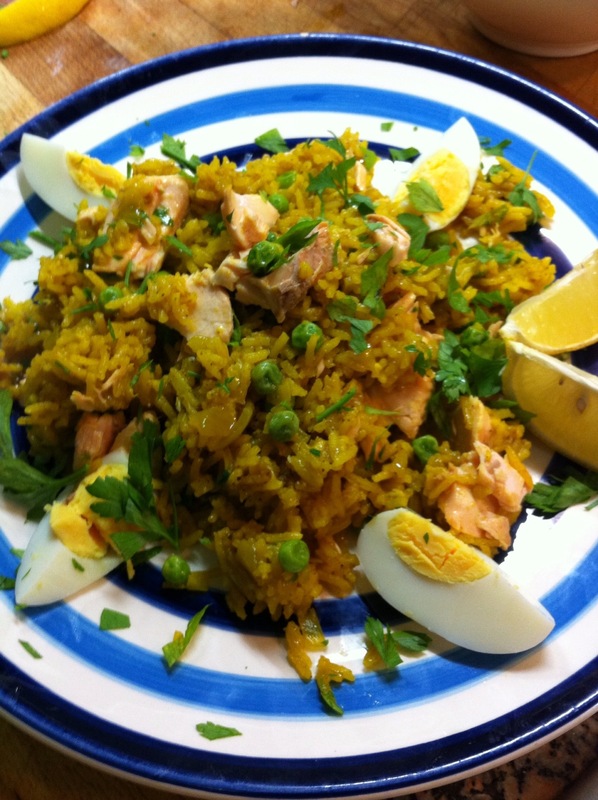 Kedgeree is at its most basic, a dish consisting of boiled rice, flaked fish, curry powder and hard boiled eggs. It is thought to have originated from an Indian rice and bean/lentil dish called Khichri, and widely believed that the dish was introduced to the Uk by returning British soldiers who enjoyed it in India whilst serving there during the British Raj. During Victorian times it was served as a breakfast dish, as part of the very fashionable colonial Anglo-Indian cuisine that was sweeping Victorian Britain. Kedgeree can take on many guises; some people fry onions until crisp to scatter over top before serving, others add sultanas into the mix, some use a variety of fish (e.g. smoked haddock). Celebrity chefs have turned the recipe from a simple putting together of ingredients into a much more decadent dish by using every ingredient in your spice rack or by using ingredients that you need to spend your lunch break searching for! 1st: Boil eggs until they are hard boiled. Set aside and allow to cool. 2nd: Place a salmon fillet per person into a saucepan. Cover with water and add peppercorns, salt and bay leaves. If you’re feeling adventurous add a few crushed cardamom pods. Simmer gently for 10mins. Allow to cool in the liquid. 3rd: Chop a medium sized onion and fry in some butter. 4th: Once the onion is soft, add a couple of teaspoons of curry powder to the saucepan and stir. 5th: Add the rice (I use basmati) and coat the grains with the buttery, curried onions. 6th: Use the poaching liquid and top up with any extra water to cook your rice using the 2:1 method. For depth of flavour I always use a stock cube – if you leave this out check for seasoning later. e) peel the eggs and chop into quarters but serve these equally to avoid argument! *I like mine to have peas, so once the rice is cooked and whilst assembling the dish, I add frozen peas to the saucepan to cook them quickly in the residual heat. Even though its intention was to be a breakfast dish, and it is relatively simple to make, it is just not practical for me to want to cook this for breakfast – not even at the weekend! But it does make for a great light supper or a fantastic weekend brunch; especially a late-Saturday-morning-hangover-looming-brunch! However, let’s simplify this even more: dispense with stages 1 & 2, don’t bother with the hard boiled eggs and poached, flaked salmon and just open a can of tuna into the boiled, curried rice. I know what you did last summer…Biscotti! Biscotti, more correctly known as biscotti di Prato, also known as cantuccini (little corners), are twice-baked biscuits originating in the Italian city of Prato. The biscuits are oblong-shaped almond biscuits that are baked twice to give them their dry texture and quintessential snap. Due to their dry nature, they have an increased shelf life and were thus very useful for wars and long journeys. come into their own as you resuscitate them back to life when dunked! Now where you dunk them is up to you – personally a sweet wine (vin santo) or an ice cold limoncello is best but if eating these for breakfast: coffee, not tea, is advisable. Traditionally the mixture is composed exclusively of eggs, sugar, flour and almonds, however, modern variations of biscotti are easily found. Any variety of nuts are used as well as dried fruits and spices such as anise and cardamom. This mixture is then baked twice – first as a loaf and then each loaf is cut into oblong shapes along the diagonal which are then placed back into the oven to dry further. As a final flourish, some biscotti are also glazed with chocolate! Having more time on my hands for baking than I would normally have and having a penchant for biscotti, I decided to spend my summer exploring various recipes. So where to start? 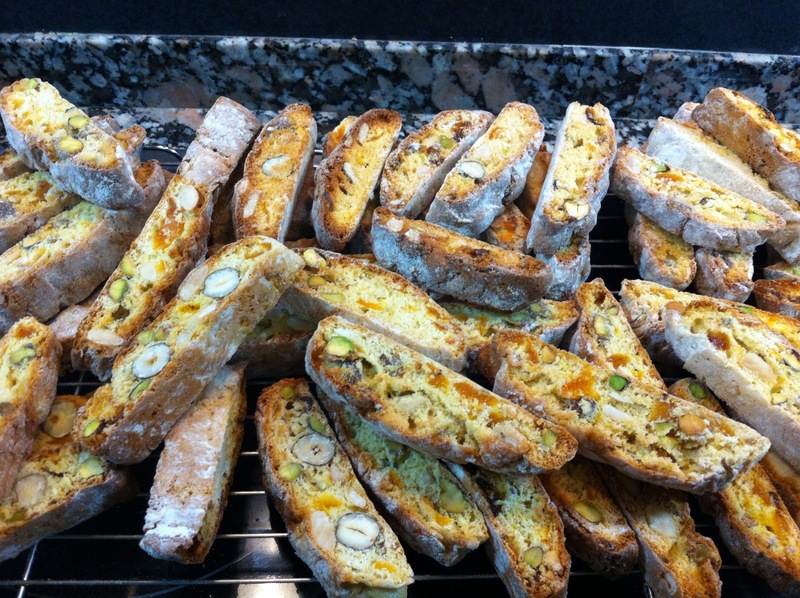 Using social media, I tweeted foodies asking if anyone had any sure fire recipes for biscotti. Nonni’s Biscotti replied back with a link to several of Martha Stewart’s biscotti recipes. Online, I also found a Jamie Oliver recipe for an almond and orange biscotti, and a pistachio and cranberry biscotti at http://www.joyofbaking.com. 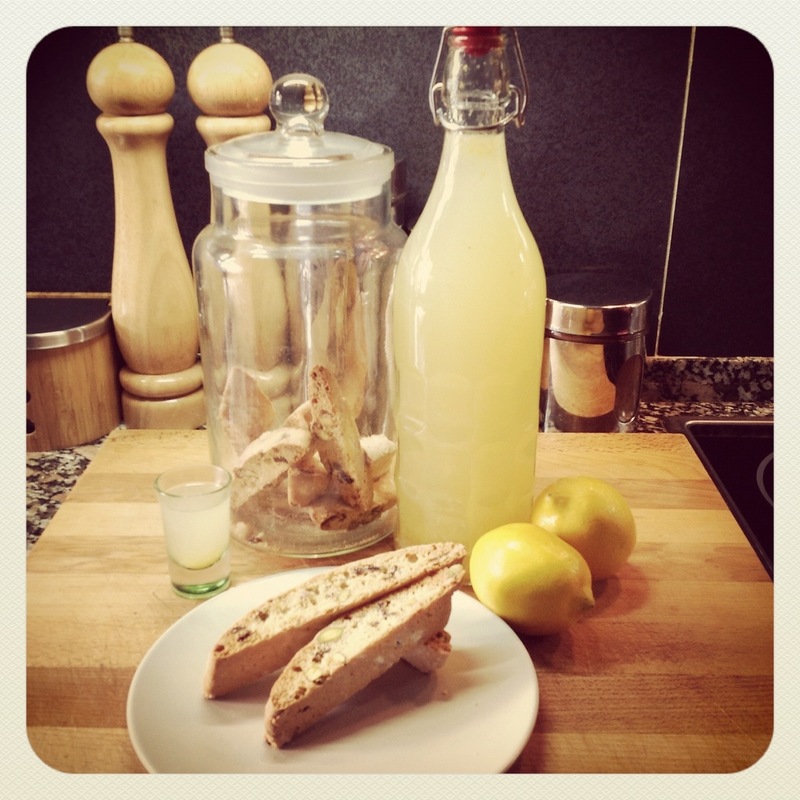 In “Desserts” by James Martin was a recipe for biscotti and limoncello (also found online). Click on the links below to be directed to the recipe pages. 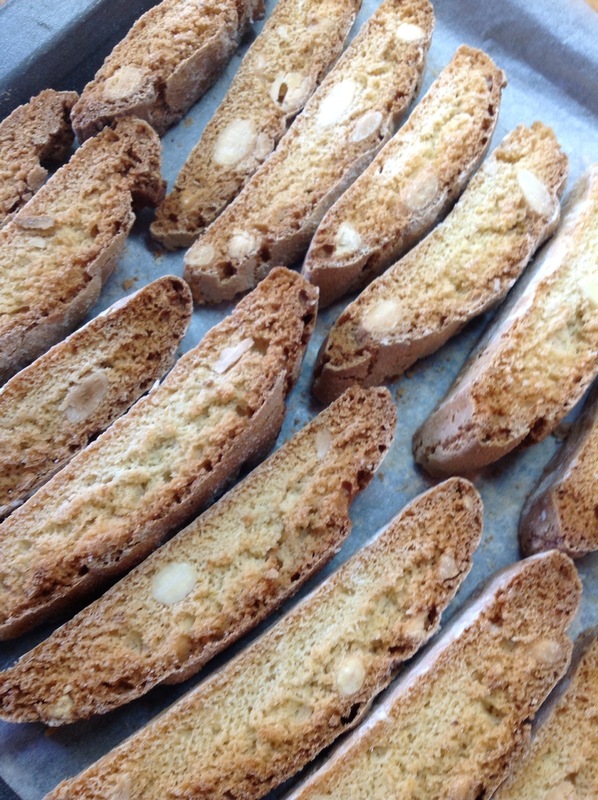 Making biscotti is surprisingly easy and not much can go wrong (famous last words)! With the three recipes above I changed ingredients and cooking times/temps. The balance of sugar, flour and eggs were maintained but the actual flavours I adapted to suit the ingredients I had at home and or wanted. With the joyofbaking’s pistachio and cranberry biscotti I didn’t have enough dried cranberries left so I added currants to make up the required weight. With James Martin’s biscotti and limoncello, I don’t particularly like dates and I couldn’t get hold of dried strawberries so I added extra dried apricots and pistachios. In Jamie Oliver’s recipe I didn’t have star anise so left this flavour out. All three recipes have been tested with everyone picking different ones as their favourite. Some prefer them drier and crunchier than others. But what is for certain is that the test group want me to bake all of them again! Considering the plethora of biscotti recipes out there I shall continue on my exploration. My only rule is not to use butter or oil, as traditional biscotti recipes were not made with this. Let me know if you’ve got any flavour combinations you’d like tested. With the soaring temperatures suffocating us into the early hours of the morning, an absolute essential antidote to the summer heat is replacing water lost through perspiration. We drink more fluids (sometimes more alcoholic than thirst-quenching but the intention is there) and we turn to food which has a higher water content. And what food has got a higher water content to volume ratio? Lettuce. There, I said it, lettuce. In hot climates, salads are not just full of water but delicious; they are colourful and made with natural ingredients that have been kissed by the long periods of sunshine until their ripe juices are ready to burst. The Ancient Greeks and Romans dined on mixed green leaves as a way of putting water back into their diet. They served their mixed leaves with a dressing of olive oil and brine as replacing lost minerals is also necessary – not too dissimilar from the salad dressings used nowadays. Ancient Times had their ‘mixed greens’, the Renaissance Period the ‘Salmagundi’ (a salad comprising of cooked meat, seafood, fruit, leaves and nuts) to the Modern Day ‘Chef’s Salad’. Ultimately, the basic salad has remained the same: a bed of mixed greens. The remainder of the ingredients added to the salad being up to the chef’s discretion. The original ‘Chef’s Salad’ devised at the Ritz-Carlton was of smoked ox tongue with watercress leaves! As a result of this creation, hotels and upper class restaurants started presenting their own salad concoctions. Each trying to outdo the other. As well as salads having a variety of ingredients assembled together to surprise the discerning eater, chefs started to add warm ingredients to salads. Such as warming eggs to create a dressing for a Caesar Salad or boiling potatoes still served warm in a Tuna Niçoise salad. Every salad – no matter its ingredients – is only as good as its dressing! Here are some recipes (more assembly instructions) you must try to help restore your faith in salads. 1st: Tear the mozzarella balls and places around the plate you are going to serve this on. 2nd: Cut around the peach and remove the stone. Then likewise tear the peach into pieces that are similar in size to the mozzarella. 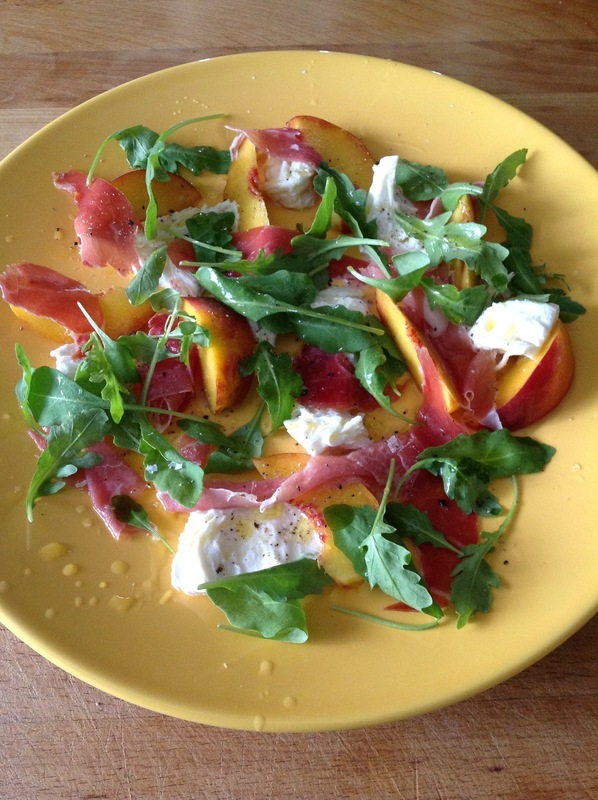 3rd: Tear strips of cured ham and drape in and around the pieces of peach and mozzarella. 4th: Add rocket leaves to the dish. 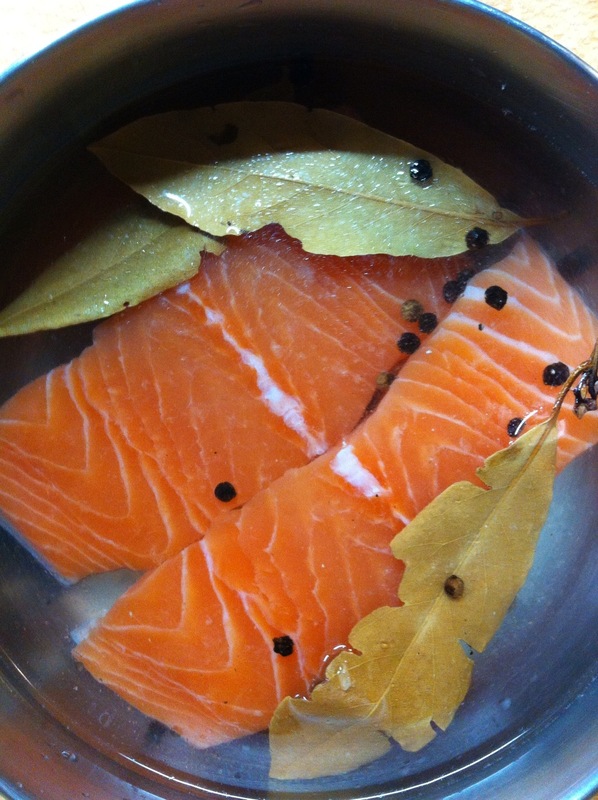 5th: DRESSING: squeeze the juice of a lemon over the dish and add a generous glug of olive oil. 6th: SEASON: sprinkle some freshly cracked black pepper over the plate. NB: Make sure that the peaches are at room temp before assembling this salad as you don’t want to be in tooth sensitive pain as you bite into this! If you can’t get seasonal peaches then swap them for conference pears which are great in this recipe. Use any cured ham your stomach or your pocket desire. As a starter at a dinner party serve with a french baguette to soak up the juices that your guests will be fighting for that have collected at the bottom of the dish! 1st: Cut a small red onion into rings and place in a bowl to steep in the juice of a lime and sprinkle with Maldon salt. 2nd: Cut the watermelon flesh off its rind and remove as many black pips as you have the patience for! Place watermelon chunks onto your serving plate. 3rd: Cut a block of feta cheese into chucks and add to the serving plate. 4th: Add the red onion to the dish. 5th: DRESSING: Pour the now pink lime juice and olive oil over the dish. 6th: Add flat leaf parsley and some mint to the dish and SEASON with freshly cracked black pepper. OPTIONAL EXTRA: add black olives to the salad. NB: Mix everything gently so as not to break the feta or watermelon too much. I’m not suggesting we all start chomping rabbit food until bushy tailed but salads can be a delicious, filling, refreshing light lunch as well as an accompaniment to any evening meal. 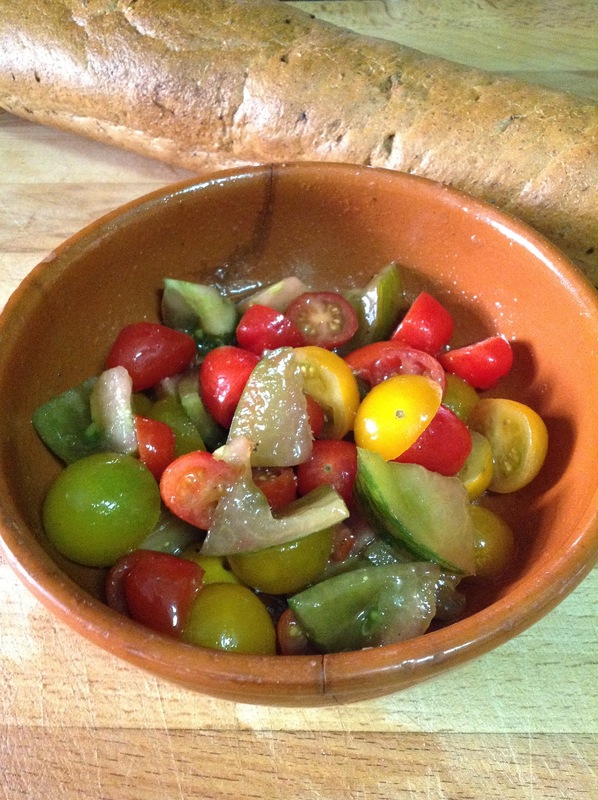 Some of my favourite salads are just one ingredient doused in olive oil and sherry vinegar and chopped garlic, such as the tomato salad at the top. Unlike baking, assembling a salad is free from restriction, just think about flavour combinations you like and how to best present them in their simplest form. Feel free to reply with your favourite salads.